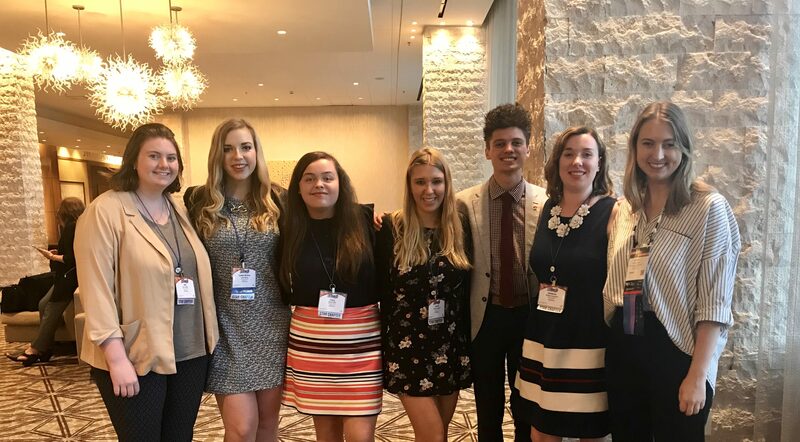 Belmont University students and faculty were honored at the 2018 Public Relations Society of America (PRSA) International Conference and the Public Relations Student Society of America (PRSSA) National Conference held Oct. 5-9 in Austin, Texas. Belmont PRSSA received its 10th consecutive Star Chapter Award, recognizing 10 criteria of excellence. Belmont PRSSA is one of only two chapters, out of more than 360 across the country, to have received the Star Chapter Award each year since it was established in 2009. Lydia Bailey, president of Belmont PRSSA, and Johnathan Pushkar, a May 2018 graduate and an officer in Belmont PRSSA in 2017-18, received PRSSA National Gold Key Awards in recognition of their chapter leadership and contributions. Dr. Bonnie Riechert, faculty adviser to Belmont PRSSA, was honored for more than 10 years of service as a chapter faculty adviser. She has served as faculty adviser to Belmont PRSSA since 2006. Riechert and six Belmont chapter officers were joined at the PRSSA awards banquet by Keith Miles of MP&F Strategic Communications, who serves as the chapter’s professional adviser. The conference included a Diversity and Inclusion Celebration event, at which Riechert accepted the honorable mention award on behalf of PRSA Nashville in recognition of the professional chapter’s efforts to promote diversity and inclusion. The concurrent professional and student conferences had a record-breaking attendance, with 1,600 professionals and 900 students attending. The theme of the PRSA International Conference was “Communications Convergence,” and the theme of the PRSSA National Conference was “The Art of PR.” Next year’s annual conferences will be held in San Diego, and in 2020 the conferences will come to Nashville. Founded in 1947-48, PRSA is the nation’s largest professional organization serving the communications community with a mission to “make communications professionals smarter, better prepared and more connected through all stages of their career.” Its membership collectively represents more than 30,000 members comprised of communications professionals spanning every industry sector nationwide and college and university students who encompass the Public Relations Student Society of America (PRSSA). PRSSA was established in 1967-68. Belmont PRSSA was chartered in 2005.